The wonderful Reiki volunteers eager to share the loving vibes before the event! 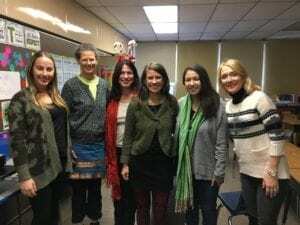 This past weekend, I volunteered at one of my favorite Reiki events: a Holiday Boot party for children at a grade school in Chicago for the 3rd year. Winters in Chicago can be brutal and not all the kids and their families at this school may have the resources to buy winter boots. That’s where the amazing Sara McCarthy comes in – she organizes this amazing party for the children so they can get the boots to make their feets toasty warm! In addition to the children getting boots, they get to go shopping for a Christmas present for their parents. Since presents are typically a surprise, the parents aren’t allowed to go boot shopping with the children, and instead they are directed to the Reiki room for a short Reiki session (about 10 to 20 minutes). I was joined by 5 of my wonderful students to give Reiki treatments. 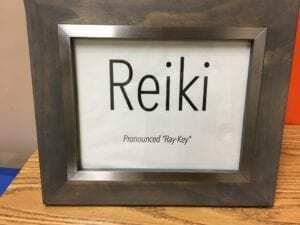 Many of the parents walking into the room are unsure of what Reiki is and why they’re there, and that’s to be expected for they most like have not heard of Reiki before! But we did have a few surprises. One mom walked in with a big smile on her face, telling us that she was an esthetician and she knew all about Reiki. She instantaneously zoned out once a volunteer started to give Reiki on her, only opening her eyes when her toddler daughter found her, yelling “mommy!! !” from across the room. I had a few favorites about the day. One mother went so inwards during the session, 2 volunteers had to gently nudge her to return. She opened her eyes in shock and said “Wow! I totally went somewhere! I feel amazing!” When she walked out the room, one of the volunteers exclaimed “this is why we do this” with a big smile. Towards the end of the event, we started getting people who were volunteering in other areas of the event, from the ones who were doing crafts with the children to faculty at the school. Many of them had never experienced Reiki, but shared that they were stressed with various aspects of their lives and wanted relief. My absolute favorite moment was when someone walked in looking rather grumpy with a frown on his face and when he walked out, he was holding his hand over his heart, as if to touch the peace and joy that Reiki can bring. This is a yearly event in Chicago. If you are a Reiki practitioner and you would like to join in for 2018 and after, please send me an email and I will put you on the list!